Play house with over 500 pieces to mix, match and make! 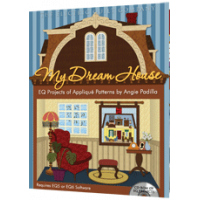 Modify Angie’s prize winning designs for fused or needle-turn appliqué in any size you prefer. Make the quilt projects as designed, or create your own pillows, tote bags, wall hangings, and quilts using the motifs. Quickly print the designs onto pre-treated photo fabric, cut out, fuse and quilt. So easy! You’re the “interior designer” for your own Dream House projects. Includes seasonal decorations — decorate your dream house for the holidays! Contains blank houses to fill with furniture and accessories. Perfect for children/grandchildren projects. Make furniture repositionable by backing with flannel to “stick” to your house. PLEASE NOTE! The block patterns cannot be printed directly from the block file, and must be installed to the EQ User Library, so you need EQ6, EQ7, or EQ8 software to print the patterns. 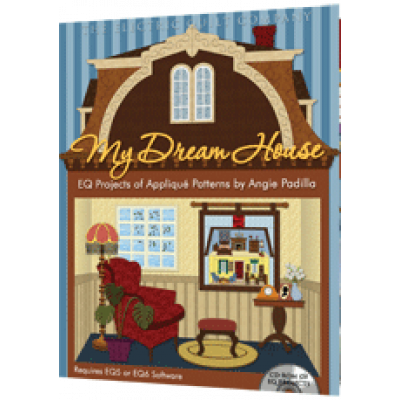 Mix and match blocks from this collection of 270 applique patterns to design your very own teatime t.. Mix and match blocks from this collection of 115 applique patterns to design your very own fashion o.. Mix and match blocks from this collection of 115 applique patterns to design your own seasonal quilt.. 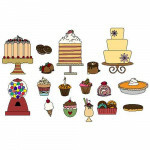 Mix and match blocks from this collection of 125 applique patterns to design your very own sweet, sw..